I've upped my foot care routine and have been using a super moisturising Foot Cream by Liz Earle and their super sweet Moisturising Foot Socks which remind me of elf shoes! I've used these every week for the past 3 weeks and love them, I use them at night and my feet are all warm and when I wake up I love taking them off to reveal super soft soles! I wash them in the washing machine on a 40 and they dry in no time. They are worth £4.75 for sure, these would make a great stocking filler with a tube of the Foot Repair Moisturiser which comes in two different sizes. You can choose between the 100ml full size which retails £13.00 or a mini size 15ml £4.75. 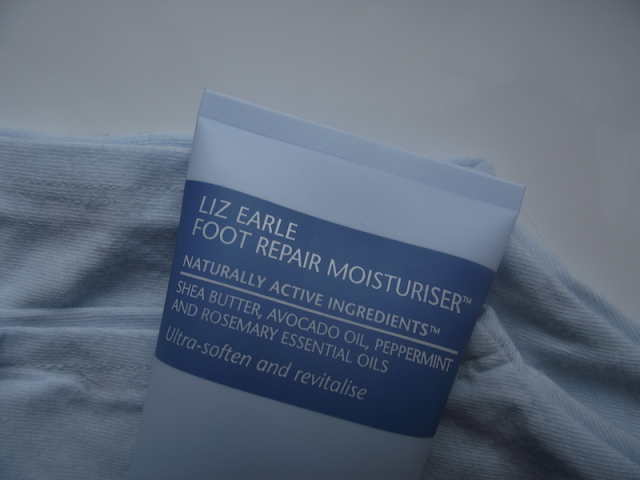 Foot Repair Moisturiser feels and smells lovely like all Liz Earle products, I have dry cracked heels and also suffer from dryness on top of my feet. Even through the winter I need to make sure I use my foot cream because my sin gets dry and itchy which means my feet become inflamed so using this foot cream will be great because of the amazing ingredients. Avocado, wheatgerm oils and shea butter are all great for softening the skin with essential oils Peppermint, Rosemary, Patchouli and Eucalyptus all add to the magical aroma which I adore! I use the Liz Earle foot scrub before hand which is smells out of this world also, I would love to bottle up the scent as a perfume! You can read my review of the foot scrub here. If you are a Liz Earle devotee or new to the brand you will be super excited to learn that Liz Earle have now launched their own Liz Earle TV which is invaluable for customers if you ask me. A new video channel dedicated to showing interesting, informative and easy to use videos that help bring Liz Earle to life. The range of videos are set out so you can easily access either Skincare, Haircare, Bodycare, Mens, Fragrance and also learn about the Liz Earle story. It will be possible to see where many of the remarkable botanical ingredients used in the range are grown and to get rare glimpses behind the scenes that will show how much care and attention we take to bring you the very best of British beauty. Liz Earle herself offers her own personal guide to achieving healthy, beautiful skin, combining her years of experience as a researcher, writer, broadcaster and botanical specialist, with her lifelong passion for natural health and wellbeing. Liz will also dispel beauty-myths by providing informed, well researched, considered and balanced viewpoints. New Liz Earle TV comes complete with a simple, click-to-buy function. This will enable customers to simply order products, directly whilst watching the videos. Easy to use, share buttons built into the site, allow customers to send on videos to their friends and families - for example gift guides, to help loved ones choose gifts. Liz Earle, Co-founder at Liz Earle Beauty Co, said, "Liz Earle TV is another huge opportunity for us to engage with our customers. Education, expertise and service is and always has been, at the heart of what we do and so we are really excited to be even more accessible, 24 hours a day and to be even more available to our customers via Liz Earle TV." Have you tried either of these? Do you want to? Thanks for reading & don't forget to check out Liz Earle TV.